While acoustical tiles are not exactly the stuff of RF engineering, their properties and their effects on sound waves are analogous to RF absorbers and their effects on electromagnetic waves. Reflections that cause multipath reception of signals that contain the same information but are out of phase and unequal in amplitude to the primary (direct) path seldom combine to enhance the overall signal-to-noise ratio, so placing absorbent material in the surrounding environment is necessary to improve signal quality. This article from Popular Electronics goes through the process of outfitting an area with acoustical tiles and give some empirical test data from before and after. You can improve the listening quality of your hi-fi system, especially stereo, with acoustical tile. How this new component helps make hi-fi sound better, and how you can install it in your house, will be describes in this, and future articles. Enjoyment of hi-fi - especially stereo - can usually be improved by installing acoustical tile in the listening area. Measurements have been made to determine the practical effects of installing acoustical tile. Above is the test room before it received acoustical treatment. The many hard surfaces in this room made the enjoyment of music very difficult. Treatment of test room with acoustical tile results in better room acoustics and better looks, too. Professional sound-measuring instruments were necessary to obtain data on the results of installing various amounts of acoustical tile. Fig. 1. 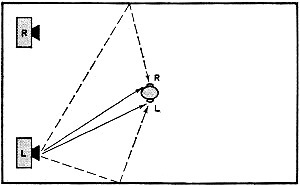 The solid lines indicate direct sound paths; the dashed lines show some possible paths for reflected sound. Fig. 2. 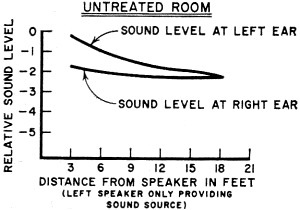 Untreated room shows negligible differences in sound levels at left and right "ears" beyond 6 feet from speaker. Fig. 3. 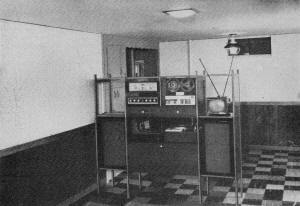 After treatment with acoustical tile, test room shows improved stereo separation up to 15 feet from speaker. 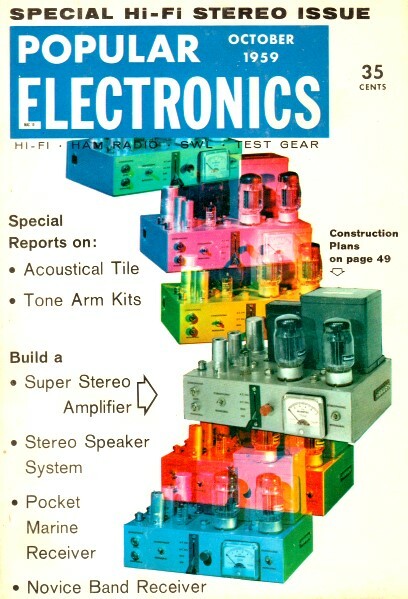 The manufacturers of hi-fi equipment have been able to provide many methods of controlling sound - bass and treble tone controls, filters, loudness compensating controls, and so on. But all of these exert their effects on the sound before it is produced. To provide complete control of sound, we need some way of regulating the sound after it is produced. This we can do only by altering the acoustical properties of the listening room. One way to achieve acoustical control is by putting sound-absorbent furnishings - chairs, rugs, drapes, etc. - in the room. Obviously, this method is limited in flexibility by practical factors; after all, only just so many overstuffed chairs can be fitted into any given room. A simpler method involves the use of acoustical tile. This material is particularly good because, in addition to its sound-controlling properties, acoustical tile is easy to install, flexible in installation, and is available in a variety of decorator patterns. Cost is surprisingly low and the results, from an acoustical standpoint, are well worth while. How does a sound-absorbent material like acoustical tile work? Well, imagine that you are in a room with four hard walls and a volley of ping-pong balls, rather than sound waves, is being propelled from your speaker system. The ping-pong balls will bounce merrily back and forth from wall to wall. Now, while the original balls are still bouncing around, if a second volley of balls were to be "shot" out of the speaker, all the balls would mix together and it would be impossible to distinguish one group from the other. This, in effect, is what happens to sound when it is reflected from hard-surfaced walls, ceilings and floors. The direct wave of sound from the speakers mixes together with the reflected sound. By the time the music reaches your ears, it has been so colored by room acoustics that no amount of knob-twisting can make it sound realistic. Now consider what happens when sound-absorbent materials are added to the room. When sound hits them, it stops bouncing around like so many ping-pong balls, But you can go overboard using these materials; unless you are careful, too much sound absorption will create a "dull" or "hollow" effect. It's plain to see, therefore, that acoustical problems cannot be solved by merely adding sound-absorbent materials indiscriminately. The acoustic surroundings must be controlled. And this is where acoustical tile comes to the rescue. By installing acoustical tile on the ceiling and then applying varying amounts of tile on the walls, any degree of sound absorption can be attained. Because of its extreme flexibility of installation, acoustical tile offers infinite opportunities for the design of a listening room which will suit any listening taste. In addition to its importance as a sound-controlling factor, acoustical tile is useful in cutting down unwanted sounds. If, for example, you wish to listen to hi-fi in the basement while the rest of the family is watching TV upstairs, acoustical tile on the ceiling will help prevent sound transmission from one room to another. Since the introduction of stereo, the acoustical treatment of the listening room has become even more important than with monophonic hi-fi systems. Ideally speaking, each ear should receive sound from only one of the stereo speakers. The left speaker, for example, should make its strongest impression on the left ear, and sound from the right speaker should be concentrated on the right ear. For acoustical treatment in a stereo room, therefore, you may find it advisable to put acoustical tile part way down the walls along each speaker enclosure. This will help prevent sounds from the speakers from getting bounced over to the wrong side of the room. Obviously, then, the treatment of a room with acoustical tile involves not only the amount of tile used, but also where it is placed. By carefully studying the many scholarly books that have been written about acoustics, you can find out how much sound-absorbent material is optimum for a room with a given volume of air; but it's more difficult to get some practical guidance that tells where and how to install it. 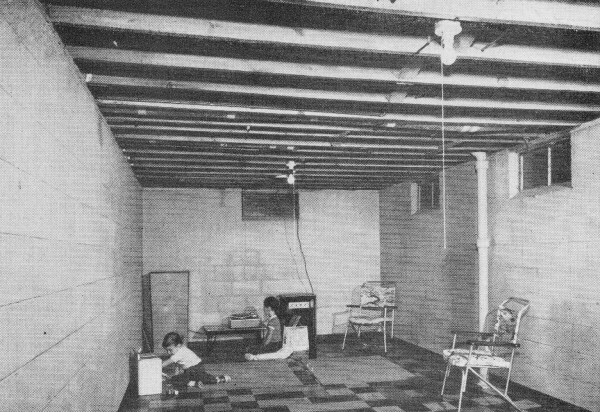 Accordingly, a test room has been set up to make the necessary measurements and evaluations Since measurements under as wide a variation of conditions as possible were desired, a basement room with concrete walls, rubber tile flooring, and open beam ceiling was chosen. By erecting "dummy" walls, false ceilings, etc., a number of different conditions could be simulated without too much difficulty. 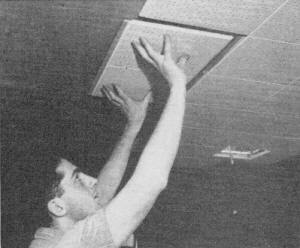 The preliminary results of these tests (which are presented in the section below) indicate that the application of acoustical tile has undoubtedly improved the acoustics of the test room, but since the study is necessarily detailed, the conclusive report on the measurements will be presented next month rather than in this issue. In the meantime, you might start checking into the advisability of installing acoustical tile in your listening room. Does Acoustical Tile Really Make a Difference? What does acoustical tile add to the enjoyment of a stereo system? To find the answer, a series of tests was undertaken during the installation of acoustical tile in a typical listening area. Stereo Acoustics. To obtain the greatest stereo effect, the left ear should receive the sound from the left speaker, the right ear from the right speaker. This situation, however, can be only partially realized because each ear also hears the "other" speaker. Our hearing mechanism is able to pinpoint a sound source because of a difference in time and level. Since the path from the left speaker to the right, ear is longer than from the left speaker to the left ear, as indicated by the solid lines in Fig. 1, a sound emanating from the left speaker reaches the right ear an instant later than the left ear. Also, the sound level at the right ear will be less than at the left ear. 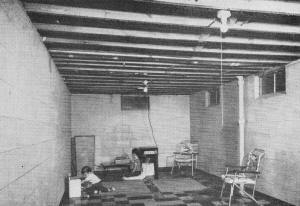 In a "hard" room, sound also reaches the ears through reflection from walls, ceiling, and floor. One possible reflected path is shown by the dashed lines in Fig. 1. These reflected sounds not only upset the ear's "timing" mechanism, but they also tend to equalize the level on both ears. 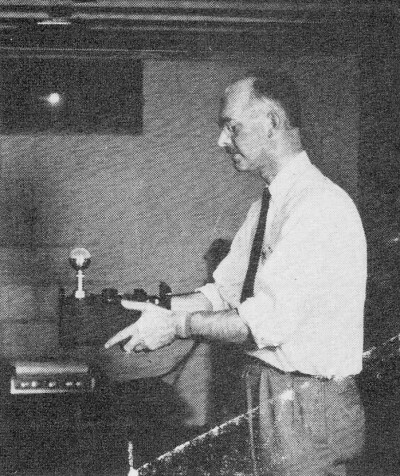 As a result, the ability to pinpoint the sound source is reduced. In order to be able to locate the sound source easily, the reflected sound must be minimized. This is accomplished by the application of acoustical tile. Measurements. To measure the effects of acoustical tile, the left and right ears were simulated by a sound level meter. With the left speaker providing a sound source, it was possible to measure the sound levels at the d left and right "ears." The results are represented in Fig. 2 and Fig. 3. Without acoustical tile, the difference between the sound levels at the left and right ears is negligible beyond six feet from the speaker (see Fig. 2). 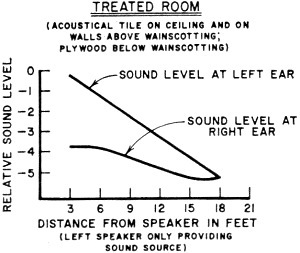 In the treated room, however, the difference between sound levels at the left and right "ears" is significant up to 15 feet from the speaker (see Fig. 3). More results will be given next month.